I actually got a race report published in a f'real paper periodical. Heh, cool! The above is from the April, 2011 Ultrarunning Magazine. So, if you subscribe to the 'zine, you'll get to see it in person. Otherwise, this is the best I can do for you :) Maybe I'll go down in history as one of the greatest Windburn Six Race Report writers of our time. Or maybe not. It remains to be seen. Hey, you know what? I had a seriously awesome 20 mile run on Sunday with my numero uno. It sorta came out of nowhere. I was feeling really sinus-y and allergy-ish, and headachey from it, so I didn't exactly have high hopes for the run, but I was certainly looking forward to being outside in the sun. There wasn't a cloud in the sky and the sun was begging for our arrival. We ran north along the path and I noticed how effortless it felt pretty soon after we started. Things started clearing up and my headache was starting to throw up the white flag of defeat. But, I noticed a sensation I had not experienced in awhile, the feeling of being almost totally outside my body. Not sure if it was the allergies or what, but I felt as though I had no control over my legs, but in a good way. It was awesome! Just shy of a couple miles into it, Geof noted we were running sub-8:20s. I logged that information into my internal calculator and held it there for awhile. It just felt too easy. Before I knew it, we were crossing Foster Avenue. Whoa, where did the last 5 miles just go? I barely had any recollection of the time already passed. Then, it happened again, we were nearly at our 10 mile turnaround and I had that same thought again...where did the last 5 milees just go? We were running without any water or fluids (on purpose...we've gotten so spoiled not having to run with bottles or packs in the cold weather!) so we made our planned stop to pick up some Gatorade at a 7 Eleven, then continued onto the Starbucks to use the facilities and get a Double Shot. We shared the two drinks and then were on our merry way once again. I was noshing on some Honey Stinger chews for something 'solid' and noted that I felt surprisingly great. I could do this all day! It felt like we were staying pretty consistent, taking no walking breaks and for the most part just running in peaceful quiet, smiling at each other from time to time, or giggling to ourselves over some of the really odd outfits roaming along the path. We both were having a really great run, and we were both equally surprised by how well it was going as neither of us felt totally up for the task before we started. Geof commented we were running sub-BQ pace for me, and I once again logged that information into my internal calculator. Hmmm, sub-BQ pace, eh? Very well. We pulled past our 20 mile mark, reached the stairs and ground to a cooldown walk the rest of the couple blocks to home. We were done. Hot damn, that felt awesome! We averaged out at 8:22, even with our 5 minute stop for drinks. Not bad. And my headache was gone! Long runs really do heal. Great report, as usual. Don't forget about all the little people now that you are a published author. 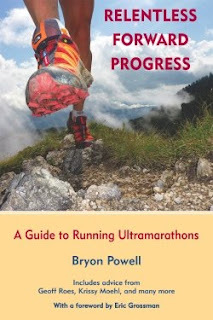 OOOOooo, can't wait to get my UltraRunning Mag. How exciting!! aw, how cool about your article! You are World Famous now - WooHoo!!! Nice job and congratulations. Great job on the run too - was not aware that any twenty milers were easy, so you're not too spoiled!!! Have a great weekend. We just got our copy in the mail yesterday afternoon...pretty fun to see that in there, not gonna lie :) World famous, lol. @Pam, that's great you were able to squeeze a run in like that. I hope I can be super multi-tasker like that one day! !